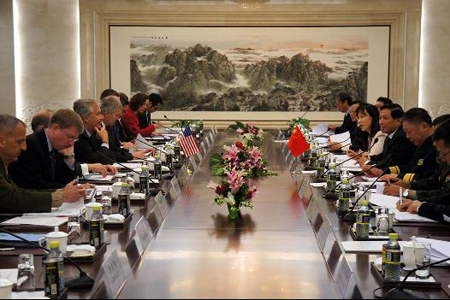 On January 23, 2014, the Inter-sessional Meeting of the China-US Interim Strategic Security Dialogue was held in Beijing. Chinese Vice Foreign Minister Zhang Yesui and US Deputy Secretary of State William Burns co-chaired the meeting. Both sides exchanged views on issues of common concern including strategic security and comprehensive security in a candid, pragmatic and constructive atmosphere. Both sides agreed to continue to bring the mechanism of the China-US Strategic Security Dialogue to full development to make it play a positive role in enhancing bilateral mutual trust.